Denise Gideon of California shares time with her friend, Sondya, 9. 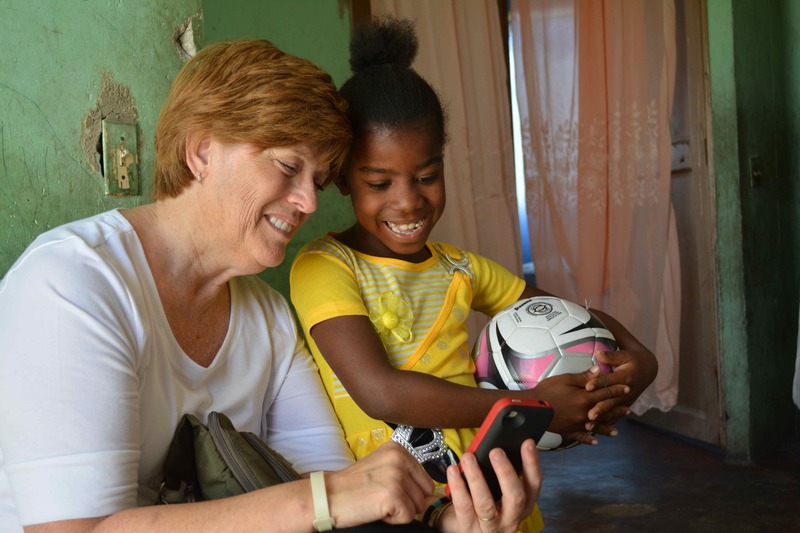 Denise is a frequent visitor to Haiti, and it is easy to see that she finds much joy along the way. I just heard a story about a woman in Haiti who had lost her hearing. She was able to study in Switzerland. While she was there, she learned to speech read — she could tell what you were saying simply by watching you closely. My friend who told me this story said this woman, who was his landlady, knew all the news in town. She sat on her balcony and watched the people on the streets and yards below. She carefully watched. It was how she listened. And learned. Aha. Yet another lesson in life — be careful what you say (even to yourself!) Someone might be watching! This story reminds me to watch and listen to others, and as I seek to make a better life, I try to pay attention to how others live. I once heard that if you want to improve your tennis game, play with people who are better than you. This is true in life as well. I am fortunate to be surrounded by people who live well. Some of them, yes, are better educated, have high ranking professional jobs and many serve in ministry. Formally serve in ministry. And just as many would find themselves surprised to be on my “Life Anyone?” list of companions. Some work in hourly jobs, making the best of a high school education. Some haven’t finished high school. Some work hard at home raising their children. Some were born in the United States. Others were born in Haiti or Canada or elsewhere. Some suffer from eye strain from too many hours in front of a computer. Some bear callouses from working with tools or machinery. Some are missing limbs or bear other scars from disaster. Some bear scars because they’ve lost a child to disease or accident. Some still mourn a loss from decades past. Some tell stories like a master. Some are somber, quiet and drifting in and out of depression. Some have lots of money, but are generous with it. Some have little of anything. Most of them, though, celebrate with joy. They all are spiritual, though we do not all worship the same God. They wake up eager to find new friends, new adventures. They enjoy eating. Really enjoy eating. Without counting calories or worrying about the latest what’s-not-good-for-you blog posts they’ve read. They don’t read what’s-not-good-for-you blog posts, in fact. They cry when they feel like crying. Without shame. They breathe. Often. And deeply. They stop to look at sweeping vistas, sunsets, blooming flowers. They feel. Whatever it is. They really feel what they’re feeling without fighting the emotions. They pray — even in public — if that’s what the moment calls for. They care about strangers, too. They always have something for the offering plate, even if it isn’t much. They dress as well as they can, but seek comfort. They visit with others, even when it doesn’t seem they have the time. They call people just to say hello. They understand that work is not life, but a means to financing life. They know how to apologize, then move on. They acknowledge the years they’ve invested in learning to live well. They are kind to animals. They seek out children in a crowd, because they recognize kindred spirits. They rarely worry about what will come. They just put one foot in front of another.